Mckenna Collins is a 21-year-old from Waunakee, WI. She always knew she wanted to be a Badger, but she never dreamed she would be Miss Wisconsin. 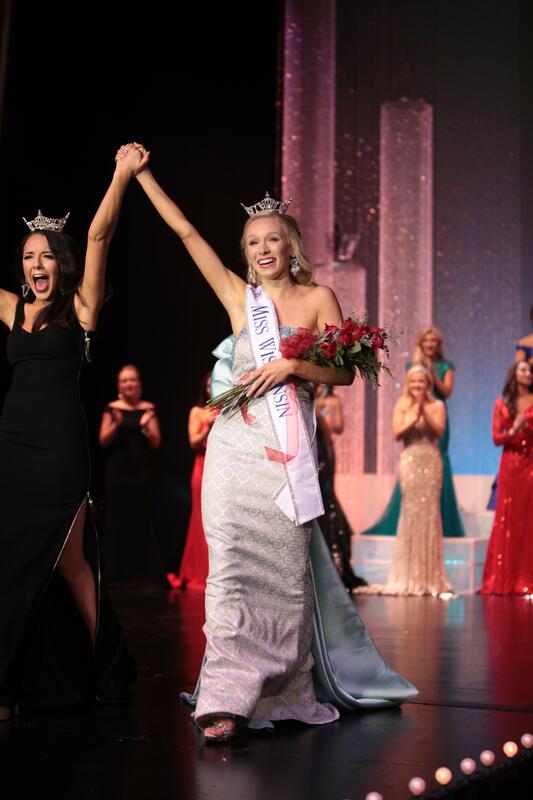 Before she was crowned, Mckenna was a UW-Madison student, studying political science and communications. We sat down with her to talk about what it's like to be a Wisconsin pageant queen. How did you get involved in pageants and what are your favorite aspects about the competitions? I started a program called Project Plie Wisconsin. It was a dance outreach program inspired by my work as a professional ballet dancer for three years. I wanted to share my love and passion for dance with children who otherwise would not have had the opportunity. I became a community partner with the Boys and Girls Club and brought dance classes to the club on a weekly basis, and ended up receiving a scholarship and grant for this work. I wanted to do that on a larger scale, which is how I began thinking about competing for Miss Wisconsin. So, you didn’t know you wanted to compete in pageants until later on? No, no. I am not a pageant girl, so to speak. This was my first time competing for the title, but I am in love with the program. The Miss America Organization is actually the leading scholarship provider for women in the nation, giving out three million dollars to women in scholarships every year. When I won Miss Wisconsin, I won a $10,000 scholarship that will help me pay for my undergrad and start law school. Do you know what you want to do with a law degree? I interned in Washington, D.C. last fall for Speaker Ryan. I fell in love with D.C. and love working in government. My plan is to go into policy advising on Capitol Hill. Could you explain a little bit about your platform Table Talk? When I was working in D.C., I would open the newspaper or turn on the TV and see negative rhetoric all over the place. I think we have a communication problem and that’s something I wanted to address as Miss Wisconsin. I think having respectful, open minded dialogue will help us move forward as a country. It’s very difficult to get things done in Washington and in daily life when you have heated rhetoric. So with Table Talk as my platform, I talk to Kindergarteners about what it means to speak with kindness, put yourself in someone else’s shoes and live by the golden rule. I speak on college campuses about my own experience as both a college democrat and republican and how that has kept me open- minded and respectful of other points of view. I have sat down as Miss Wisconsin with several senators and representatives to talk about promoting open minded, respectful communication in their constituency. Without open respectful dialogue, it’s difficult to get things done and to move forward. Do you have any tools that you would suggest using in conversation to promote open dialogue? When I talk to audiences, I talk about my Table Talk Tips and the pillars of communication: listening, understanding and expressing respectfully. How do you feel the current administration is doing in regards to women? I love that Ivanka Trump is taking the rains on that issue. We need more leadership roles for women in government. I was so inspired by Representative Martha McSally when I was in Washington. She stood out to me as a mover, shaker and someone who led with compassion. I hope to see this administration do more to get women in positions of power and support women in government. Are there any women’s rights you feel strongly about or would advocate for? I’d like to see the pay gap decrease. As a professional ballet dancer for three years, I experienced an enormous pay gap firsthand. Male dancers are paid more than female dancers. It’s not right. Women are working just as hard, if not harder, in the company. My parents. They have always pushed me further than I thought I could go, encouraged me to compete for Miss Wisconsin and helped me finish up high school online, while I worked a 50 hour a week job with the ballet company. Aside from my parents, I really admire Representative Martha McSally. Her story is incredible. She worked in the Airforce before becoming a representative and is epitome of what a strong woman is. She has so much poise and confidence. Pageants receive a lot of backlash for promoting unhealthy body standards and reinforcing outdated gender roles. How do you respond to these notions? The swimsuit portion is one of my favorites. It’s about promoting a healthy body image. We are all not able to conform to one shape, one size fits all. As long as we are making healthy choices on a daily basis, that’s really what it’s all about. What does a typical day as Miss Wisconsin look like? I wake up and do press at 6am. Then, I hit the road in my Miss Wisconsin car. I’ll drive across the state to La Crosse and do an appearance. I’ll finish my day in Green Bay. I’ll do events for non profits. It’s a year spent serving the state and promoting Wisconsin businesses and organizations. My favorite part about it is being able to meet people across the state. At the end of this year what is one thing you want to accomplish? I want to have a legacy of compassion left behind me. My main goal is to spread kindness, smiles and lead an overall more compassionate life.